Back in 2013 I finally put down in a course the tools and techniques for accessing consciousness that I had been using in my teaching with fantastic results. I called it Conscious Learning, as that was the original focus, but it soon expanded into other areas, Conscious Leadership and eventually Conscious Living, the ultimate objective of my desire to share these tools and techniques that have helped me and my students over the years. I have come to realise more and more the power we have to wield over our lives and it all begins and ends with accessing consciousness. I have also come to realise the it is inextricably linked to our four states: physical, mental, emotional and spiritual – and the health of each state, which needs constant love and care. feeling before I could consciously articulate it, that we are more than our bodies and there are a few scientists who are finally taking this idea seriously, based on the unsatisfactory explanations that conventional science has to explain the unexplainable. One cardiologist has even proven that consciousness continues after clinical death and has made it his mission to understand how, and so begin to answer the question “what is consciousness?” in a scientific way. If, like me, you are not a scientist, just curious as to how to harness the incredible power hidden in your consciousness, there is plenty for you here too! What therefore started out as a single article on how to access consciousness, is now evolving into a series, since I feel the need to explore and explain the different aspects of consciousness and how we can tap into it to live our lives at peace with ourselves and the world around us, and create the life we want. I draw on teachings from all over the world, different ages and in different fields from personal growth to neuroscience, medicine and other scientific disciplines which help my left brain cope with the creative right brain invasions. In this post I will talk about the mental side – our brains and our thoughts, both conscious and non-conscious. Of course our brains form part of our physical bodies, so I touch on the physiology of the brain as the context of mental consciousness and to explain how by increasing our awareness of how the mind works we gain access to massive additional mental resources (here’s a quick “preview” nugget for the left brainers (and everyone! ): they reckon we have a storage capacity of 2.5 petabytes (a million gigabytes). Now that’s worth accessing, right?! We have 100 billion neurons which process up to 400 billion bits of information per second, or, in number of “operations” (like the processing speed in a computer’s CPU) an estimated billion billion (1018 per second – I’m using the American standard not the old European). But, of course, we are only consciously aware of a fraction of that information. Most of it is pre-processed by our sub-conscious or non-conscious mind. This is the part we are interested in accessing more fully. 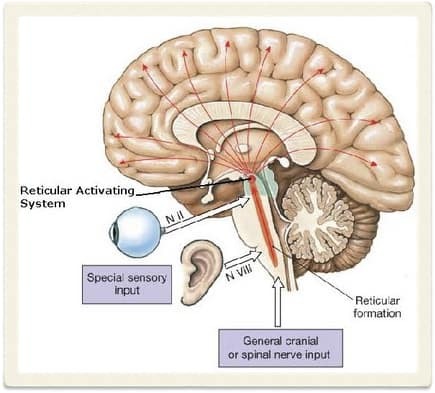 This pre-processing happens via our Reticular Activating System (RAS), a small nerve centre at the back of the brain which connects it with our nervous system. The RAS is responsible for filtering out information which is considered unnecessary for our immediate or imminent needs. This is why we only notice what’s on our (conscious) minds and miss things until we decide consciously we need something – like a “new” phone shop when your phone breaks, that was actually opened 2 years ago! Or new resources we need to grow our income or gain a promotion (more on that in a later post too). In my Conscious Learning course, I introduce the apparent paradox that most learning happens sub-consciously – so why am I talking about Conscious Learning?! To answer the question I talk about the idea of “being conscious about your sub-conscious/non-conscious mind” and in my teaching, rarely a session goes by without some explicit explanation and use of tools for accessing this consciousness. For some it is difficult as we are all influenced heavily by our parents and teachers and the environment in which we grow up, which for many is not open to ideas which are considered “woo-woo” or illogical. Amazing results can be achieved by those that are open-minded enough to play with the ideas, which is my only invitation – just as I don’t use the word “homework” as that implies an external obligation which our consciousness rejects (I live in Catalonia and the Spanish and Catalan words for homework actually mean “obligations”!). So I invite my students to explore these ideas which have had such an impact on my life, giving concrete examples. Still people sometimes reject them and that is their choice. As Albert Schweitzer said, example isn’t the main way to influence people, it’s the only way, so all I can do is live consciously and congruently myself and therefore lead by example. At its base, my Conscious Leadership programme has this as one of its fundamental principles; being an inspiration that people want to follow is far more powerful than imposition. I have a funny personal story to show you the power of accessing consciousness in your daily life. I say funny, but at the time it was quite painful. I had had a problem with the nail on the big toe of one of my feet. Nothing serious, enough to cause discomfort – especially when my clumsiness stubbed said toe against a step or wall – but not enough for me to actually take action to sort it out. So I thought a few times about mentioning it to one of my students who’s a doctor – that way it wouldn’t involve a trip to the doctor’s (something else I’ve now learnt to be more conscious about in taking care of myself!) Trouble is, I kept forgetting, as my conscious brain wasn’t giving it the continued importance that my toe did when I actually whacked it against the stairs! – “Ok,” came the reply. Yes, I really did have this conversation with my toe in my car! And guess what. On arrival at my destination, I had a little twinge from my big toe, which told me “Hello, it’s me, remember to talk to the doctor about me”. So I mentioned it, asking that perhaps we could talk about it after the class. And as we were getting up to leave, Big Toe piped up once more, as requested, to remind me. And because he happened to be the resident doctor at the Retirement Home, where we did the class, he took me to the infirmary and had a look, before asking the nurse to extract a portion of ingrowing nail, thus alleviating the pain. It’s a simple example, but it showed me what was possible. Clearly I wasn’t actually talking to my big toe, but the part of my brain that registered the pain – and accessed the consciousness that enabled me to remember at the precise moment I programmed it to. As I say, it’s a small example in itself, and I shall be going into more depth in future posts. For example, I will talk about how I teach my students to use their instinct when answering questions and “guessing” the meaning of words. What feels right to them is often the right answer, at least once they have learnt to distinguish the signals they get. What sounds like an irrational claim turns out to have a logical basis: if you are a committed student who is actually interested in learning a language, you will spend time reading, listening and watching to authentic media. It is therefore likely that, even if you don’t actively record every unknown word and expression, you will have come across it or something similar and your “instinct” is simply your non-conscious mind letting you know that it has information that has not yet been passed into the conscious mind for processing. As I say, this is really scraping the surface, an introduction to accessing consciousness. I will be offering guidance and practical steps on how to increase your access to your inner resources of mind in future posts and emails. But for now, I hope this has helped you realise both the benefits and the ease of which you can begin to do this. Coming soon: Is there consciousness after death?